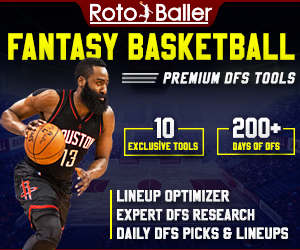 Welcome to the RotoBaller NBA Recap. 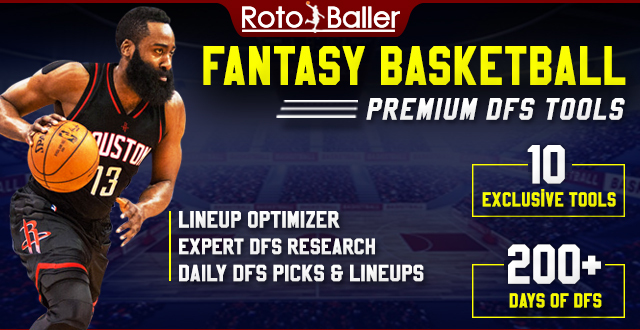 In this feature, we highlight three fantasy basketball takeaways from last night's slate of NBA games. One thing that happened that doesn't have implications moving forward for you in fantasy but has to frustrate you if you were playing any of them last night is what happened with the Sacramento Kings. A tired Kings team was down 74-44 at the half, so head coach Dave Joerger decided to just not play the starters at all in the second half. So while Buddy Hield scored 21 points in 18 minutes, other Kings starters who were definitely in your fantasy lineup didn't fare so well. De'Aaron Fox scored zero points in six minutes, Willie Cauley-Stein scored one point in seven minutes, Nemanja Bjelica scored nothing in five minutes, and Bogdan Bogdanovic bested those three by just a hair, scoring five points in 10 minutes. In the second half, it was Yogi Ferrell, Frank Mason, and Harry Giles leading the team, just like everyone expected. That was a fluke, though. Let's look at three takeaways from the December 17, 2018 slate of NBA games. It's been a really great year for Tobias Harris. Harris is averaging 21.5 points per game on the season, the highest mark of his career, and Monday showed that he's not just a guy who can give you 20-25 points but instead that Harris can be a potentially explosive scorer. While a lot of the NBA's recent scoring explosion has been driven by the three-pointer, it's not so easy to explain Harris using that idea. He was 3-for-6 from three on Monday as part of a 15-for-22 overall mark on the night, and on the season he's actually taking fewer threes per game than he did last season. 70 percent of his attempts are coming from two, up from 63.6 percent last season. Harris's improvements have been fueled by a higher usage rate and, in another bit of an anomaly compared to the rest of the league, the ability to create shots without assists. Just 33 percent of his two-point shots are coming off assists, a career low, and 81 percent of his threes off assists, also a career low. And he's eschewed the corner three, taking just 11.8 percent of his threes from there; last year, it was 22.7, but even that was far lower than other years in his career, including a 55.6 percent rate back in 2013-2014. That Harris is succeeding while not being a cog in the offensive as he has been in the past and instead being the focal point of the offense is a great sign that Harris is a star in this league, and fantasy owners should be very happy with his contributions. Is Jevon Carter Fantasy Relevant? I was a big fan of Jevon Carter when the Memphis Grizzlies picked him in this year's NBA Draft, because he seemed like a perfect fit for their system. A great defensive guard at West Virginia who shot nearly 40 percent from three the past two seasons, Carter presented an upgrade at the backup point guard spot for Memphis. And then, a knee injury kept Carter out for the season's first 28 games. He made his debut against the Rockets on Saturday, playing 22 minutes and scoring 11 points on 5-for-9 shooting. On Monday, with Mike Conley out with a hamstring injury, Carter was the backup point guard to Shelvin Mack and played 25 minutes. So did Mack. The two split the point guard role in Conley's absence. Monday wasn't a great statistical outing for Carter, who had five points, three rebounds, two assists, and a steal, and his original outlook for the season is complicated by the Grizzlies being good and likely sticking with the veteran Shelvin Mack as the main backup to Conley. But Conley's hamstring complicates things. If he comes back soon, Carter is likely to fall out of the rotation, but if he misses some time, Carter has a chance to give the Grizzlies good minutes and earn some of Mack's minutes once Conley returns. Carter isn't a fantasy option at this point, but owners in deep leagues should keep a close eye on him. James Harden has been on fire, and it's fueled the Rockets to a four-game winning streak that's made the team look a lot more like last year's number-one seed than this year's disaster. Fantasy owners are universally playing Harden on a nightly basis, but if you're a DFS player reading this and are struggling to figure out who to spend the big bucks on, or if you think the Harden owner in your season-long league is ready to make a deal at the right price, let's look at Harden's production over the past four games. After scoring 47 on Monday, Harden's averages on the winning streak are 39.5 points, 7.3 rebounds, and 7.5 assists per game on a shooting split of 51.1/37.5/89.1. His usage rate is 39.9 percent over that span; it was 37.3 on the season before the streak. Houston seems to have found a winning formula, which is letting Harden go wild on defenses. He's hitting the glass more, and he's got a pair of triple-doubles over this span. As long as this formula keeps the Rockets winning basketball games, don't expect them to deviate much from it.